Microsoft announced Wednesday Windows 8 is finished and, as rumoured, build 9200 is the final version. It's been "released to manufacturing," or RTM. The first people to get RTM will be developers and IT professionals with MSDN and TechNet subscriptions, but not until August 15. Microsoft partners and customers with Software Assurance (a volume licence that includes free updates and is available even for small businesses) can download it the next day. Action Pack subscribers (typically IT consultants and trainers) get it August 20 and other volume licence customers can buy it September 1. The rest of us can buy an upgrade – or a new PC with Windows 8 – October 26. That's when Windows RT systems, including Microsoft Surface, will also be available. RTM has "many promised refinements," according to Steven Sinofsky in the Building Windows blog, but Microsoft won't be "sharing exact details on what's new" until the code is available August 15, a Microsoft spokesperson told TechRadar. We do know that the desktop will have a flatter, Metro-style look with the Aero Glass effects removed to better match WinRT apps (and to further increase the already impressive improvements in power savings and battery life). RTM will also have the touchpad gestures if you have the right kind of trackpad; you can swipe in from the sides to get charms, switch apps, open the app bar, close applications or pinch for Semantic Zoom. This only worked on only a couple of systems during the beta. Microsoft isn't saying exactly which touchpads will work, but we expect that many of the latest multi-touch trackpads will be supported. RTM also means the Windows Store is open for business and developers can start charging for their apps (everything in the store has been free until this point). However, you won't see pay-for apps in the store until you get RTM. As you can't download the RTM yet, Microsoft suggests running the Release Preview instead. There are 7 million PCs running the Release Preview already and another 9 million PCs installed the Consumer Preview and Developer Preview . That's 16 million total, which is four times as many Macs currently running Mountain Lion. 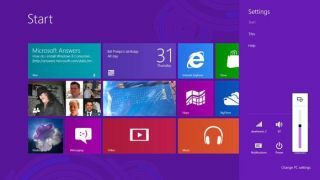 San Shepherd, a Windows 8 developer and creator of the Star Chart app, told TechRadar Windows 8 is "the Swiss Army knife of operating systems." "It can work on anything from a slick augmented reality engaged tablet through to a powerful desktop rendering behemoth and everything in between." While Shepherd anticipates his app dynamically changing thanks to the OS, most of us will have to wait to explore the new world of Windows 8.